New Product Arrived, From Now To July 10, Contact Us To Get 10% Celebration! Whether you're watching TV, gaming, partying or working out, this TV soundbar delivers enhanced deep bass withfull-range 3D stereo sound giving you a superior audio experience. DIVASS sound bar have 6 wire or wireless connections (AUX / Optical / Coaxial / USB / HDMI ARC / Bluetooth), suitable for most audio devices, you don't need jack adapter anymore. One soundbar, work forall device, for your TV, PC, Cell phone, etc. When you want to switch the TV signal input, you need to keep pressing switch key until changed to the signal you want, which is very troublesome. DIVASS Bluetooth soundbar have 6 connect methods, so we improved the remote control for this problem, each mode has its own button, one key quickly switch to the mode you want, without waiting. DIVASS sound bar speaker will automatically switch to "Sleep Mode" to save power when it has stopped working for 15 minutes, please don't misunderstand it's defective. Powerful 2.0+ Soundbar: 4 full range Stereo Speaker, cover more than 500 sq. ft, Base on 2.0+ channel audio, more bass than other 2.0 soundbar, create an amazing home theater music experience. Detachable Design: This Bluetooth speaker no only a sound bar, but also can freely assembly to a 33.2 inch sound bar or detach to 2 pieces satellite stand stereo speakers. 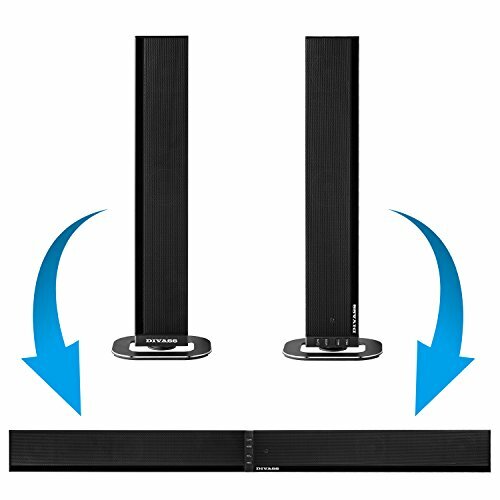 Place Anywhere: Super Thin body, You can choose to act as sound bar or 2pcs stereo speakers according to your home decoration. This compact sound bar also can installs in bedrooms and small environments. Wire and Wireless connections: More than just wired connection with AUX\Optical\HDMI\Coaxial modes, stream your music wirelessly with powerful built-in Bluetooth. Just Plug in the power and connect it, no need any other debugging. Service Pledge: Customer can return product unconditionally within 30 days , we promise all questions will be responded and addressed promptly. If you have any questions about this product by DIVASS, contact us by completing and submitting the form below. If you are looking for a specif part number, please include it with your message.